When Demetrius Demetrio was growing up, every time a homeless person asked for food at his family’s house in the northeastern Brazilian city of Recife, Demetrio’s parents would invite the beggar to sit at the table and have a meal with the family. Born in Rio de Janeiro and raised in a military environment in Brasilia, the boy did not understand why human beings were eating out of garbage cans, or why he should share bread with them. Demetrio used to walk to school every day along Imperador street in downtown Recife. Even today, that street draws many homeless people from the rest of that city, which is the largest city in Pernambuco, as well as its capital. Of the 1,200 counted by the city government in 2017, half live in downtown area. Demetrio used to duck his head and just smile at the panhandlers as he had nothing to give them. He came to be known among them as the “smiling boy.” Decades later, the smiling boy would establish Comunidade dos Pequenos Profetas – CPP (Small Prophets Community), a nongovernmental organization helping some 400 children and teenagers who live on the streets in poverty. In one of his daily walks as a schoolboy, passing the Santo Antônio Convent, Demetrio heard Helder Câmara, the Archbishop of Olinda and Recife addressing an audience. He stopped to talk with Helder, who invited him to join a group that spent Tuesdays afternoons socializing with those in need. The young man used to play games with them, offer them first aid and distribute food. But he knew that this was not enough. 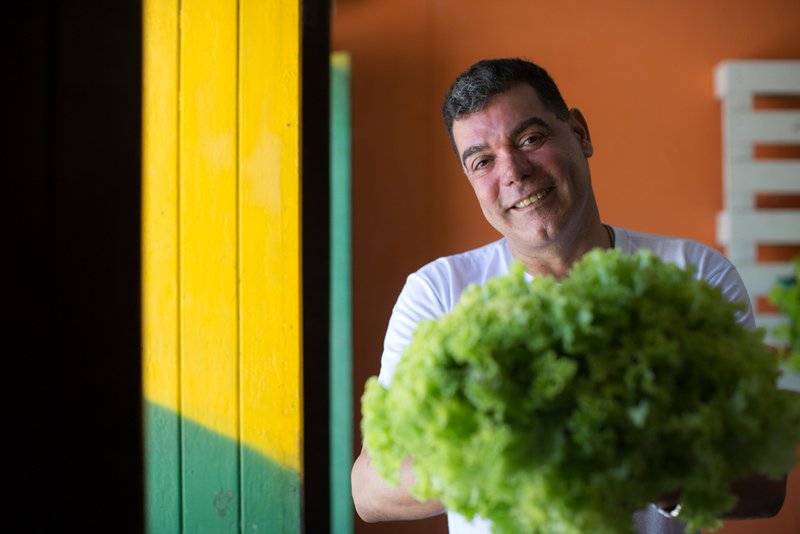 During this period of living without shelter, sometimes sleeping on the street, Demetrio would pick up vegetables discarded on the floor of the outdoor market, wash them and make soup for his fellow homeless people. Sometimes the police would throw away all the food. Police brutality toward homeless people is common in Recife. If Demetrio saw someone being beaten, he would defend them. He has two scars on his jaw and has had plastic surgery on his nose. He was arrested and threatened with death several times. After a year, he began living in a shed, where he was able to make a much greater quantity of soup, feeding as many as 200 people at a time. Demetrio’s work attracted the attention of foreign scholars and entities and he received awards from German and Swiss organizations. He sought instruction in administration and pedagogy to formalize his initiative throug the creation of Comunidade dos Pequenos Profetas. 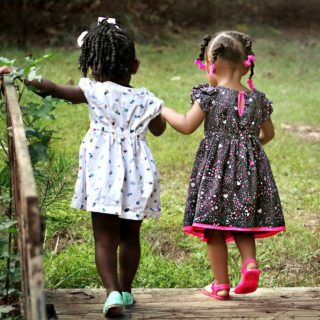 The NGO’s team, which serves, at least indirectly, some 20,000 people, develops activities focused on encouraging education, women’s empowerment and access to food. When the children and teenagers are not at school, they take part of reading sessions, sports practice and art production with recyclable material. One of the workshops is named Reinventando o Brega (Recreating the Kitsch), recognized by Prêmio Objetivos de Desenvolvimento do Milênio (Millennium Development Goals Award), which honors projects that contribute to the achievement of the sustainable goals defined by the United Nations. In that workshop, boys and girls recreate the lyrics of a folk song from Pernambuco, changing the woman’s role. Demetrio studied gastronomy in school, and through his academic knowledge created a vertical vegetable garden project, Semear e Colher (Sow and Harvest). 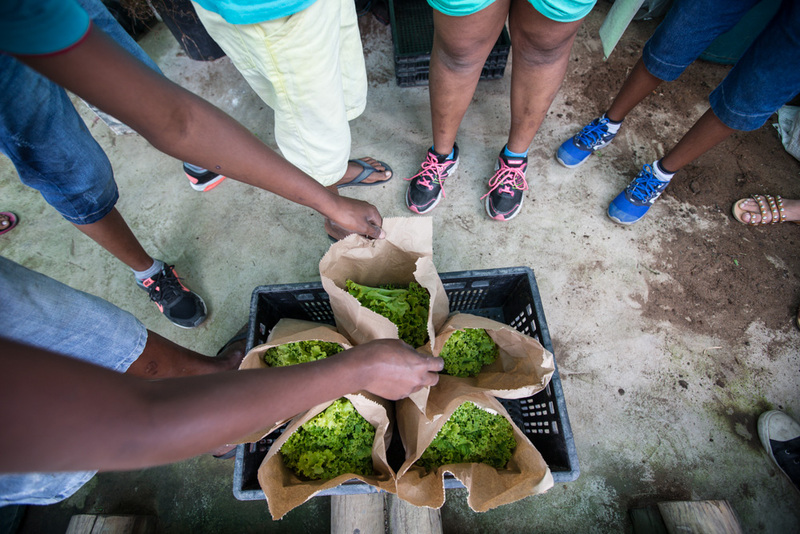 In PET bottles collected from the polluted Capibaribe river, which cuts through the city, CPP grows seedlings to distribute in the community, introducing foods such as arugula, American lettuce and leeks onto the population’s menu. In a decade, the NGO has removed about a ton of bottles from the river. The people served by CPP have learned how to plant and harvest. Every 15 days, they take home a bottle with a seedling to continue the planting process. Most do not have access to green space and many live on stilt houses on the river banks. 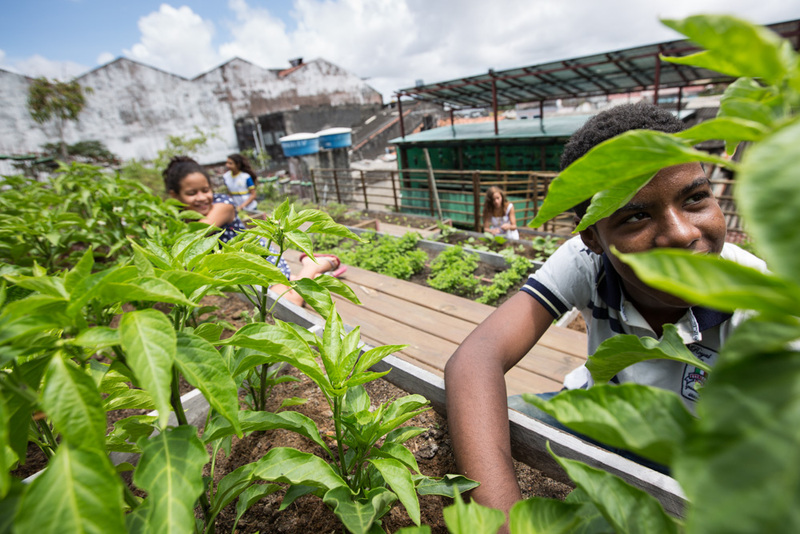 “The seedlings do not eliminate hunger, but do help supplement food,” says Demetrio, noting that the most important thing is not giving food, but knowing that it can change someone’s life. “Good nutrition boosts not only health but also self-esteem,” he says. Demetrio provides gastronomy workshops to teach people how to use the produce. The 16-year-old student João Eufrosino found, in this activity, a craft. The boy fell in love with the kitchen and he is known as the ‘minichef’ of CPP. 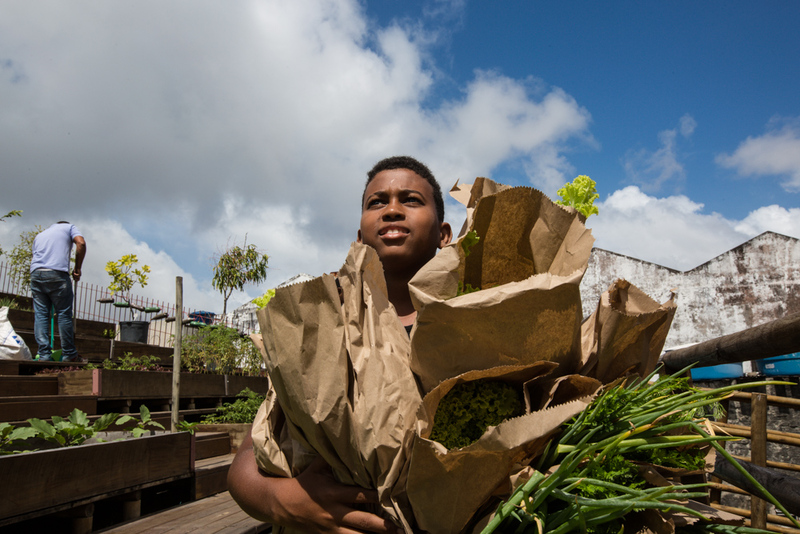 “With the vegetable garden, I learned how to make and also save food,” he says. He brought this knowledge to school, where he is setting up a vegetable garden. The 27-year-old housewife Ana Carla Araújo has felt the impact of the workshops inside her home. “My kids started eating more salad,” she says. 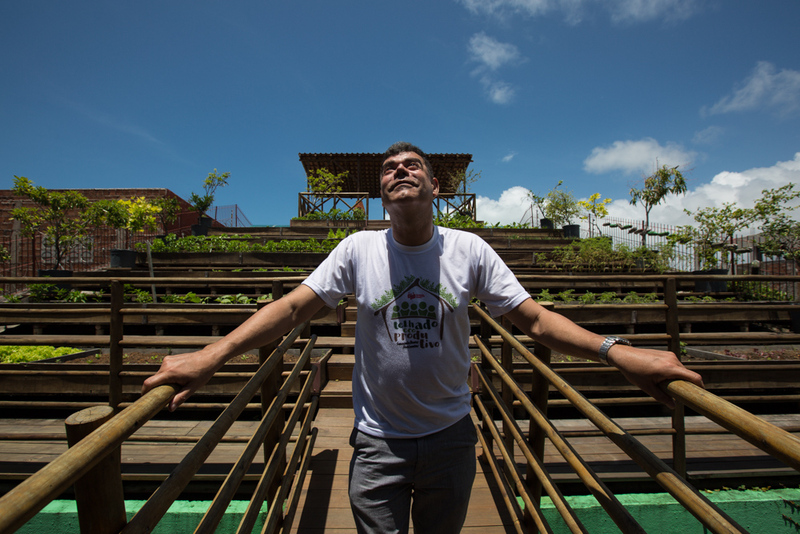 After the headquarters of the project was broken into six times, seeing the food thrown onto the roof, Demetrio had an idea: he called companies to solicit their help in turning the 400 square meters of the organization’s roof in a community garden named Telhado Ecoprodutivo – Semeando Horizontes (Eco-Productive Roof – Sowing Horizons). The structure, made of eco-friendly wood with space for solar panels, stands out in the gray metropolitan landscape. 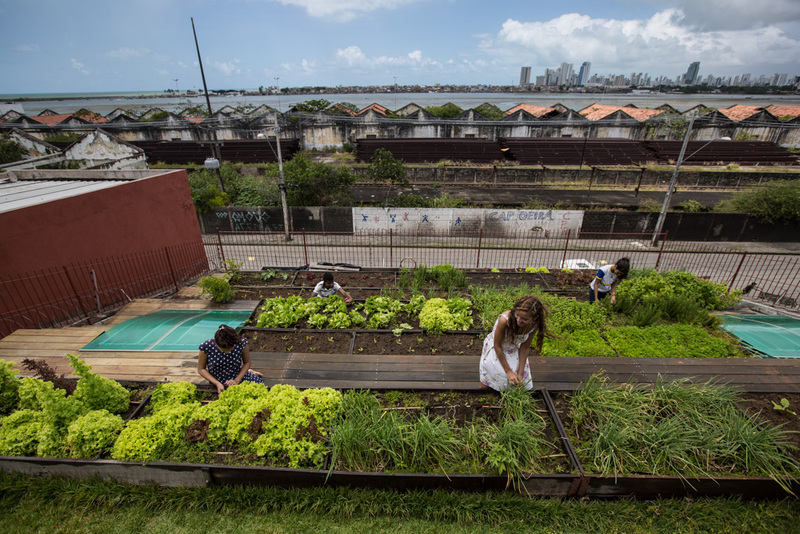 There are 20 flower beds, one sowing and lots of green: Coriander, parsley, green onions, lettuce, mint, sapoti, mango, pitanga. The cultivation work is done by the young people receiving services from the NGO and by their relatives, with the help of CPP staff. 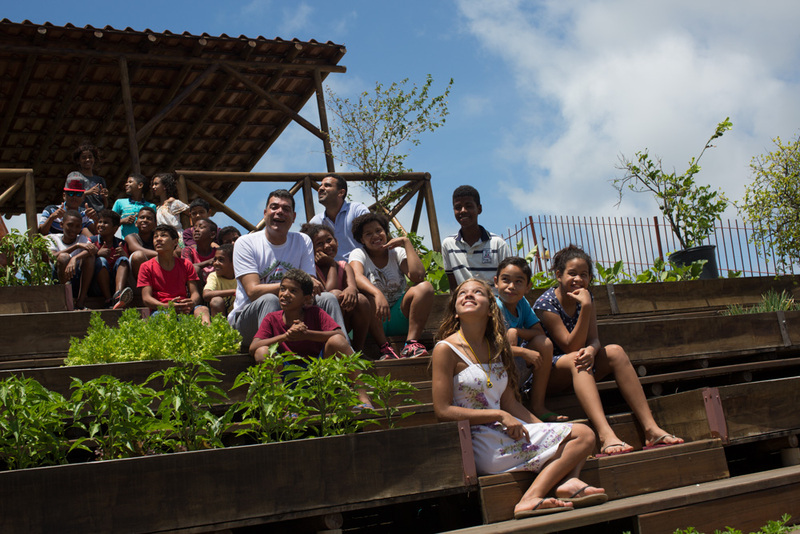 In 10 months, the roof yielded an estimated savings of 13,000 reais (about $4160 USD) in the purchase of food for 70 families. But the gains are incalculable. The 35-year-old attendant Paula Ferreira was shocked when her youngest daughter Marcela had a hypertension crisis. The girl was not even 3 years old and had a fried food-based diet. Ferreira introduced more greens at home, once she learned how, with Semear e Colher and the eco-productive roof. The results were immediate. 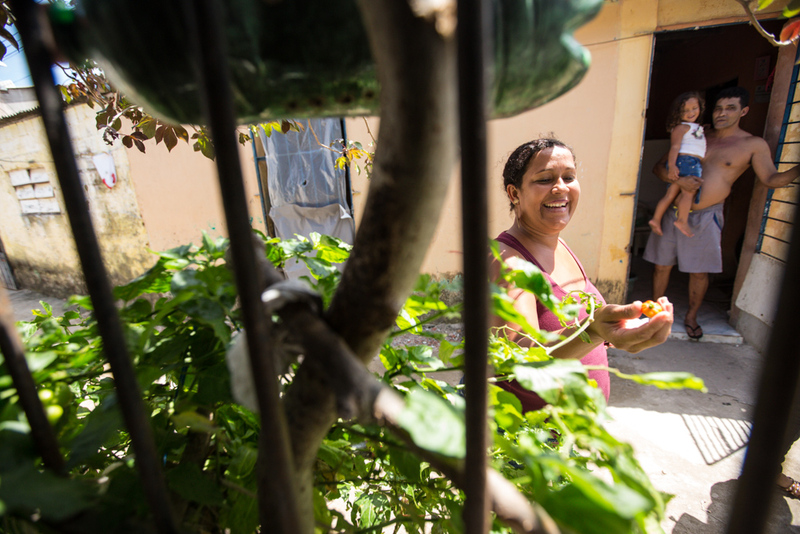 Marcela began losing weight and her mother was motivated to call her neighbors to build an organic nursery in the Cardão slum community, where she and her daughter live. Ferreira now plants peppers, coriander, mustard and arugula in front of her house. “My daughter weighed 20 kilograms (44.09 pounds) when she was 20 months. Today, she is 18 kilograms (39.68 pounds) and 3 years old. 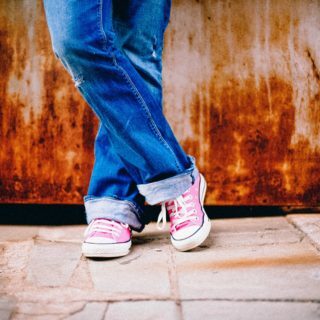 Our health changed,” she says. The eco-productive roof is becoming an agricultural research laboratory for universities and schools. Any interested party can visit, for the price of a donation: a kilogram of non-perishable food. The space holds up to 50 people at a time. The project’s success in providing access to good food is also being replicated by Demetrio in his other projects, such as SoliVida, which is supported by the German institution Aktionskreis Pater Bed.